Size: Fish is 16 inches long! This is a beautiful display fossil. 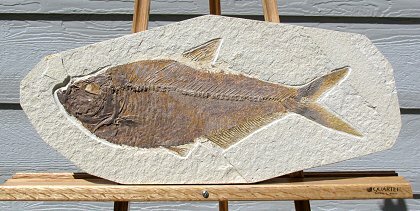 It is a HUGE Diplomystus dentatus fossil fish from the Green River Formation of Wyoming. Diplomystus is one of the most striking and beautiful fossil fish found in the Green River Formation. The fish is very well-preserved and displays extremely fine detail. The fins, tail, and backbone are simply awesome - very complete and symmetrical. The fabulous fish is aesthetically showcased on a large, semi-oval plate of oilshale. And, remember, this fish is a full SIXTEEN inches long - WOW! This is one of the largest Diplomystus dentatus fossil fish that we have ever offered, period.